The Action Stations team is a group of highly motivated, enthusiastic and experienced outdoor education professionals who are passionate about sharing their local environment in a fun and hands on way. Sheree Camilleri and Amanda Howard are the directors of Action Stations and are the passion that is driving it to the forefront of the outdoor education industry. Sheree brings the skills of a diverse career that includes health and safety background after working with the Department of Labour, community development and social work and a teaching background in early childcare and adult learners. Amanda comes from an Information Technology and Systems as well as early childcare, plus an avid fan of the outdoors. 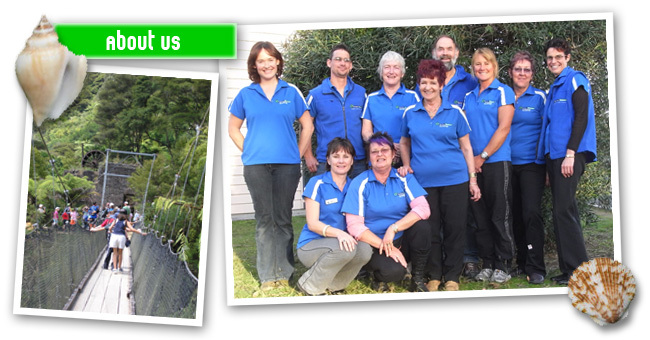 There is a great team behind them that pull together to make all the outdoor education a success. As trained primary and secondary teachers and/or trained outdoor education professionals the team at Action Stations understand through first hand experience how much time and energy goes into creating a successful experience. They love the outdoors and seeing people of all ages and backgrounds, from young school children through to business professionals and overseas travellers, experience the thrill of being outdoors and learning about New Zealand’s natural beauty. Through our programmes that utilise whole body learning, our Action Stations leaders share their knowledge to captivate children’s interest in the outdoors with the aim of developing lifetime connections, respect and responsibilities for our environment. One of the founding principles of Action Stations is that it gives back to the community. In an age of over consumption and greed it is refreshing to deal with a business that believes in putting something back. We pride ourselves on our Rat Line. This is working with Tauranga City Council and the local Forest and Bird Society to lay baits on a regular basis on Mauao. We have been involved with this for a year now and an increased number of birds, including a record number of grey Faced Petrel fledglings this year, has been the reward for consistent effort. With these skills sets combined you know when you are using Action Stations you are going to have a great experience that is well planned time, risk is minimised, learning is maximised and you are challenged to go beyond what you thought your limits were. To provide fun interactive learning and adventure experiences, in New Zealand’s natural, cultural and social worlds, delivered with passion to inspire participants to take positive action. Listening to clients and delivering above and beyond their expectations. Creating a working environment that captures the enthusiasm of team members, sparking creativity, fun, loyalty whilst delivering uncompromised service. Team members demonstrating interdependency, accountability to each other to create a synergistic, ecologically, sustainable business. Sustainability, creativity, valuing diversity, enjoyment, integrity and accountability, respect.